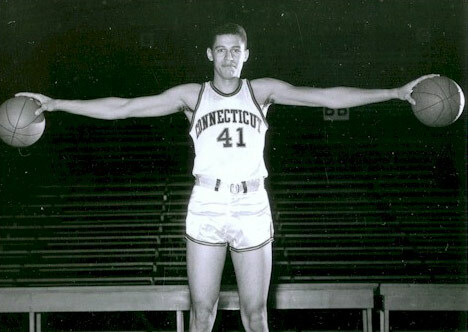 Al Cooper was a Center for the UConn Huskies from 1956 – 1959. He’s a member of the UConn Basketball All Century Ballot, was an All Yankee Conference first team selection, a key member of the Yankee Conference Championship teams and the National Collegiate Athletic Association tournament teams. He averaged a double-double for his three-year varsity career with 11.9 points per game and 10.9 rebounds per game. I spoke with Al in August 2004, as he reflected on his basketball, and life experiences, and his continued involvement with the University of Connecticut. As a freshman in high school he played very little. As a sophomore he played on the junior varsity team. When he was a senior, he was co-captain of the team, and the team made it to the State Championship game. They lost, but Al had a very good senior year and made All State. That’s when coaches at the University of CT took an interest in him and in New Brunswick High School. In making his college decision, he could have gone to Rutgers, which is in New Brunswick, NJ. He used to deliver papers to the Rutgers basketball coach, and Al’s father worked at Rutgers in the Institute of Microbiology. Al didn’t want to go to college in the same town where he went to high school. A couple of University of CT coaches came to his house to discuss going to UConn. Al felt that UConn had a very well respected basketball program from a regional perspective, and made the decision to go to UConn. When Al got to UConn, he met Wayne Davis, a teammate who he ended up being roommates with for four years, and both were co-captains of the team their senior year at UConn. Playing on the freshman team, Al, Wayne and Bill Schmidt led the team to a 13 win and 1 loss season. His sophomore year he had the most fun while at UConn. The team was good—it won the Orange Bowl Classic in Miami, which included teams such as Seton Hall, Pittsburgh, Stanford and others. They also won the Yankee Conference, went to the National Collegiate Athletic Association Tournament, and led the nation in scoring that year with the highest scoring average per game. Al was named to the All District One, All American First Team, and was elected First Team All Yankee Conference, and was the first sophomore to be elected All Conference unanimously. While at UConn, Al's family came to CT to see him play three-four times a year, and attended games in NY, like Fordham, NYU or at Madison Square Garden, and Rutgers University. After graduating from the University of CT, Al worked for an insurance company for a few years, then for a conduit and cable company. He also worked for New Jersey Bell Telephone Company, and for 32 years he worked for Johnson & Johnson, as Vice President of Corporate Relations until he retired in 2000, and relocated to Skillman, New Jersey, about 20 miles from New Brunswick. Al also got involved with politics. He was the first black person elected to public office in New Brunswick – served as a member of city council, became president, and served two years as mayor of New Brunswick. He was also on the Board of Education, and he was elected to serve as a delegate to the Democratic Convention in 1968 in Chicago, IL. Al has been active with his involvement at the University of CT. He recently was elected to the Board of Directors of the Alumni Association, he has served on the Board of Directors of the UConn Foundation, a member of the Founders Society, UConn Health Center, and serves on an advisory committee called the UConn African National Congress (ANC), a joint venture between UConn and the University of Fort Hairz in South Africa. In New Jersey, Al serves on the Board of Directors of the New Millennium Bank, and the New Brunswick Development Corporation. Al said his mother, father, and sister – family life, and the experience at UConn, being on his own, and spending time developing himself helped him to get along in life and become who he is. The discipline of sports helps to build character, and a value system, needing to be on time, dressing accordingly, and abiding by team rules, and personal conduct. Al met his wife, Judith, while at UConn, and during August they will celebrate their 44th anniversary. They have two children, Aldrich Cooper III, who is married, and lives in Baskinridge, New Jersey, and a daughter, Jill, who is married, and lives in Washington, DC.